A chic yet relaxed dining spot in the 10th with a great value lunchtime set menu. 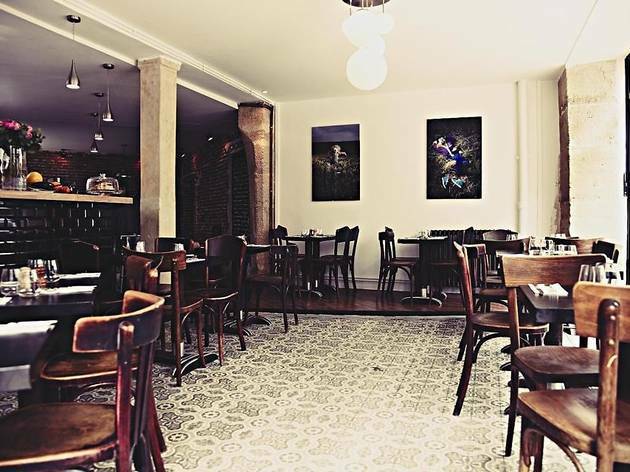 In New York, Flat Iron is a small area of Manhattan situated around the Flat Iron building – which inspired the decor of this restaurant, situated on the corner of rue Sainte-Marthe and rue de Sambre-et-Meuse. 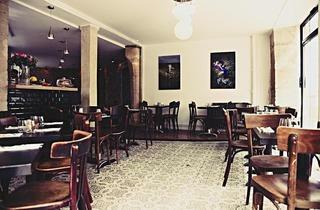 It is simply beautiful inside: red brick walls, aluminium ceiling lights, a black ceramic bar and a parquet floor. At the back of the room, a DJ spins vinyls, giving it a streetwise, chic ambiance. The staff are warm and passionate and judging the all the ‘bises’ flying around, the restaurateurs have a very loyal clientele (or a massive group of friends). Faultless starters include a comforting chestnut soup, salmon gravadlax with a delicate vodka cream and ravioli stuffed with rabbit and prunes. Trompettes de la mort mushroom and marrow risotto is to die for and entrecôte steak with crushed potatoes is perfectly cooked. A glass of Le Terrà Lisa is light, fruity and spiced all at the same time – and lovely too. As for the prices (which was what drew us to the place), the lunchtime menu is €15 for starter and main or main and dessert. In the evning, the mains are between €11 and €14. So very reasonable. At the back of the room is a private room ideal for birthdays or events such as the concerts and exhibitions that are often held there.